What I am about to tell you, should be kept confident, should not leave within of this article. Think for a second about how many passwords you input to your computer? Maybe One for your ISP? And Maybe One for your mobile ISP? And let's not forget One for all of the discussion forums you frequently visit. How much confident information you log into various web sites? Perhaps your credit card number? Or maybe your phone number? How much information you disclose about yourself? You think that information is safe? Sure, with 128bit encryption algorithms, it might be hard to crack your information out of the encrypted file. And might Years and Years of CPU time, But what I am about to tell you, might shock you. There is really no need to. That's right, there is no need for hundreds of cpu and man power to gain access to the confidential data you store on your computer. What if I told you that there is a little white box INSIDE your keyboard that logs anything you type? Are you scared? Are you ridiculing this idea? "No such things exists", and if does, only used by the CIA or FBI? Well, think again. I got into my hands, a VERY dungarees item. Something, that perhaps shouldn't have even been created in the first place. But it is here. And nothing is going to change it. So you better get to know it. Knock Knock neo. You are being watched. Ever head of the term "Key Loggers"? they are nasty pieces of software that will record and monitor about every letter you type in that keyboard of yours. And when the time is right, with a simple command, the EVIL individual who installed that software on your computer, can retrieve the entire log, can retrieve the entire content of a mouth (or perhaps even more) worth of typing, via the net, or physically being at your computer. 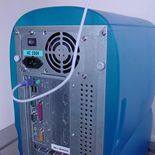 While software key loggers were around for a LONG… LONG time, since the early days of DOS and UNIX, but they always had the limitations involved of actually being installed on a computer hard disk. Which means you must boot the computer, log as a user WITH install and modification permissions, install the software, and hope that no conflicts will arise from the installation, conflicts that might give the user you are trying to monitor hints that something is strange, that something is not quite all right. So here enters the "Sovereign" class starship of KeyLoggers. The KeyGhost. But this round, it's not software based. It's hardware based. 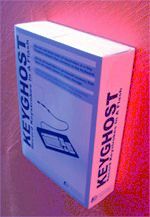 The KeyGhost is a revolutionary product, a simple 30cm long cable with a white cylinder at the middle, that when is connected to a computer, LOGS EACH AND EVERY keystroke a user enters. And can spill it all on demand, Form the same terminal being monitored, or from a computer 50km away. All you need is a computer terminal with a PS/2 port and a text editor. No need for software. Installation of the KeyGhost, simply plug it into the PS/2 port. No need for external drivers, No need to to reboot computer. No need for any special action. Simply connecting the KeyGhost to a PS/2 Keyboard port will activate it. Allowing it to feed power from the host computer (no need for any external power connector, no need for a battery, no need for an outlet), and will quietly, in the background, without ever interfering with the computer operations, without taking any system recourses will start logging every keystroke the user enters. And in the end of the day, when the user begin monitored logs off from his terminal, thinking no one will ever get access to sensitive information, you walk by the computer, pull the KeyGhost from the PS/2 port. And take it home. Once you arrive, all you need to do connect it to your computer PS/2 port, go into a text editor, and type the default password. "Vghostlog" In a single word. Without making a backspace, and to your instant sense of gratification, the KeyGhost operation menu will open up inside the text editor. C) Safe mode - this will change the speed the text is retrieved from the KeyGhost, to solve compatibility problems with old computers. 1)Downloads the entire recorded log from the KeyGhost Security Plug. 2)Downloads the log form a section you input. Let's say from char 872 and beyond. 4)Format memory - Clears AND formats the KeyGhost Memory. 5)Contains user selectable option such as - Arrow keys: select whatever the arrow keys will or will not be displayed when a log is retrieved from the KeyGhost. 6)Optimize speed - select the menu retrieval speed of the KeyGhost. Same as safe mode [c], only this time you can select the delay between each char in milliseconds. 7)Password change - will allow you to select a different password then the standard "VGHOSTLOG"
8)Checks whatever the KeyGhost is working properly. 9)Exits the menu, returns the KeyGhost into it's logging mode. The KeyGhost is a very sophisticated piece of software, in the new version, It now compress repeated keystrokes when they are stored, and displays them in a "Short" form when they are typed back from the KeyGhost memory. For example If a user types "Y" six times, the KeyGhost will later retrieve it as "zzzz(z(2x))". This goes for arrow keys, as well. Someone scrolling through a document with the down arrow won't eat pages of log, but just come out as something like "((67x))". You can turn off arrow key logging, if you like. With the 6th. Menu option. Quite smart if you ask me. While the KeyGhost is a PS/2 "Adapter" there is an AT Port convertor, in case you wish to use it on an old AT keyboard, and a USB version is in the works. While the KeyGhost will be able to work perfectly WITH an adapter attached to the Keyboard, such as an AT keyboard with a PS/2 Adapter (I have tested this using my old Focus MM keyboard), it won't work if there is any other kind of monitoring equipment attached to the keyboard you wish to monitor, such as control overlays (plugs that can override keyboard and mouse access of desktop terminals). But beside this limitation, the KeyGhost works very good. Too good if you ask me. It's so easy to operate and install it, that anyone can. Don't you see that crucial implications involved in such a high breach in user security? However, beside secret surveillance of other computers, the KeyGhost can be also used for backup for your data. (Now you have the perfect excuse to buy a KeyGhost! "No… em… I use it to STORE data… yes! That's it!" :) If you are a writer, and require a 3rd of a 4th Backup device, then the nonvolatile flash memory inside the KeyGhost will prove as an excellent mean to back up your data. It will record every single key you type, so if you are in a profession that losing even a single keystroke typed means disaster, then viola! You found another use for the KeyGhost! The data inside the KeyGhost won't be erased, not even if the KeyGhost is unplugged from the computer. And there is no "save" option, you don't have to "save" the data into the KeyGhost/ no need to worry what information is and what information isn't inside the KeyGhost. It's on the fly backup. Without the hassle of CD's or cartridges. Or slow write / read times. There are various KeyGhost models, and the one I am here to review is the basic one. The KeyGhost Home Edition. While "only" having the memory to store 128,000 keystrokes, it will add to about 20 hours of touch typing at 80 words per minute, which is more then enough for logging keystrokes throw the day. Install the KeyGhost in the morning, and pick It up later at night. 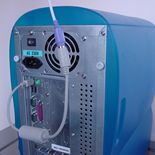 But if say, you require longer periods of monitoring, there are more professional models of the KeyGhost II available as well. With memory of up to 2,000,000 Keystrokes, and 128bit Encryption (It's not really 128 bit encryption, because the character case password only gives you 398,541,260,467,162,000,000 possible combinations… "ONLY" :) these models are perfect for long time surveillance of computer systems, without the fear of the Data inside the KeyGhost getting tampered with. So it's very safe to say, that while there is a **possibility** of tempering with the keystrokes stored on the KeyGhost, no one that will snag that logger will be able to find what keystrokes were logged without a use of a cluster of 8-way processor Unix servers, AT LEAST. The KeyGhost is a perfect solution for monitoring and harvesting sensitive information, information that might not belong to you at all. Now, I don't think I need to mention the EXTREMELY HIGH cases of moral problems involved with such a thing. And using the KeyGhost, while gives you a HUGE EGO boost, is something to take under advisement. You can't just wave your hand and make the moral problems of using such a device go away. But if such moral problems don't bother you (you Evil you! :), and you require a simple, powerful, elegant solution to track down various information on various computer terminals. You should go and get the KeyGhost II. Any one of the models. Starting from the "Basic" PS/2 Adapters, and up to Keyboards that are being sold with the KeyGhost installed inside. Impressive. But remember, you are paying a heavy price tag for each key stroke this thing logged, both in dollar terms (this thing is expensive!) and both in moral price. I really have really nothing bad to say about the KeyGhost as a product. It has a very easy installation, a very easy operation, and is extremely innovative as an idea. To sum the KeyGhost in one sentence, "A Masterpiece of Engineering". Nothing more nothing less.